Seeing a Sauber without Red Bull livery takes some getting used to, and, to makes matters worse, the airbox space traditionally allocated to the Austrian drinks company was left a blank blue after it purchased and renamed Jaguar Racing. The area has now, though, been filled with Credit Suisse signage, and, although the finance house is majority shareholder in the team, sources are adamant that additional funding has been made available in exchange for the space. It is what is under the airbox, though, that has been the subject of so conjecture recently. That the Ferrari/Sauber engine relationship runs its course at season's end is well documented, but negotiations are far from dead, and the partnership could well be extended subject to certain terms being agreed. These, like most matters involving the Scuderia of late, include not insignificant amounts of Euros. In fact, rumours now abound that Ferrari have been hemorrhaging money on the engine deal due to it originally being agreed, then renewed, in US dollars, and, with Ferrari's expenses running in Euros, the Italian company's direct costs substantially exceed the annual fee by Petronas on behalf of Sauber in exchange for the engine naming rights. And, any extension would see Sauber/Petronas compensate Ferrari for losses occurred over the past two or so years. Intriguingly these losses come at a time when engine costs are, theoretically at least, being cut by long-life regulations, so, understandably the Swiss-Malaysian alliance is fairly miffed at having to shell out 30% more for engines which should cost 30% or so less. And, when your annual engine bill runs at $25m, that indirect 60% pans out at an additional $15m. So, despite willingness on both sides to cut an extension, the most likely scenario is that Sauber will acquire BMW engines from 2006. Sauber Technical Director Willi Rampf spent his formative years there, and, prior to joining Sauber, headed up various divisions for the Munich manufacturer, including the off-road motorcycle competition department - which won numerous Paris-Dakar awards under his management. In addition, Sauber have recently committed themselves to the GPWC framework, whilst BMW is both a founder member of the organisation and banks with the Bayerische Landesbank - a substantial shareholder in the consortium presently disputing commercial control of Formula One with Bernie Ecclestone's financial vehicles. Then, Peter Sauber is more comfortable in German than Italian, and, with Hinwil but 300 kilometres from Munich, a deal could well be struck which entitles BMW to wind tunnel time in a facility designed to accommodate passenger vehicles in addition to Grand Prix cars. Best of all, such an engine deal would most likely be free, or, at most, run at $10m per annum - after all, how could BMW justify charging more, then dropping the price to the benchmark figure suggested by GPWC should its series come to fruition? So, rather than parting with $25m + 60% for two (or even three) year supplies of engines, Sauber could well land a deal free, or, worst case scenario, for 25% of Ferrari's fee. What happens then to Ferrari's engine supply capability, for, in its present state, the company is desperately maximising every revenue stream? Simple: it focuses upon one or both of the teams not fully committed to GPWC, Red Bull and Jordan/MidlandF1. Paddock rumours suggest that the latter outfit, owned by a Ferrari-driving Russo-Canadian steel billionaire, has been offered a deal at Sauber's renewal rate. And, precisely therein lies a problem, for Ferrari have every right to demand that their engines be fuelled, cooled and lubed by products at least equal in quality to Shell's best creations. First off, such a company would need a be a veritable giant in the oil industry, for a stumbling block in the ongoing renewal negotiations between Shell and Ferrari is the enormous (and exceedingly costly) product support programme required to keep Ferrari superbly reliable. Such restrictions did/do not apply in the case of Sauber, for, as published in November last year Sauber-Petronas Engineering AG developed numerous oil products on behalf of Ferrari and Shell. So, a cross-diagonal level of trust existed between the four companies, and, in any event, Petronas represents no market or product threats to Shell. Midland F1 (or whoever), though, would need to attract a market leader, for who else would have the facilities and needs to develop the required products? Would such a blue chip brand, however, wish to enter into a partnership with what is, with all due respects, an exceedingly small fish in an enormous piranha tank. For that matter would said blue chip, or Shell for that matter, be comfortable in the knowledge that the track and market opposition may have access to their innermost technical secrets? 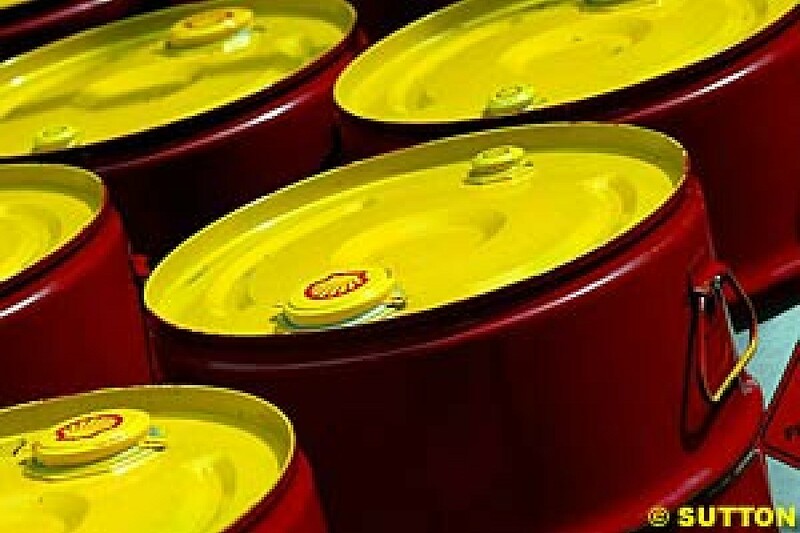 All this presupposes, of course, that Shell will continue with Ferrari beyond the end of this year. This column has long speculated about the non-renewal of the existing partnership, and twice last year the oil company let slip that it was reconsidering its involvement with Ferrari. But, now it can be revealed that negotiations are well advanced, and that the renewed deal, initially for two years with options, could be announced during the San Marino Grand Prix weekend. All fascinating stuff, and a perfectly indicative of how the undivided future of Formula One could hang on a few litres of oil. If revenge is, as they say, a broth best eaten cold, Antonio Pizzonia enjoyed chilled soup by the tureen-load today. There was the Amazonian on Mark Webber's back patch, driving a Grand Prix car whilst the Aussie was subjected to a few laps of honour in the back of an open BMW. 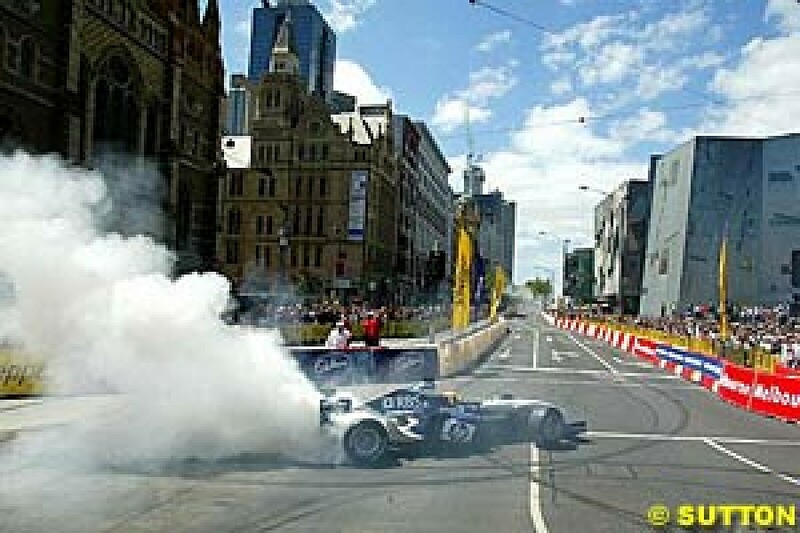 Not content with tootling up and down before same crowd Webber was waving at, the Williams tester took it upon himself to pull donuts, despite Melbourne's authorities having specifically banned the practice due to safety fears, each time he turned his vehicle within the tight constraints of specially erected water barriers. Of course the crowd went crazy, their shrieks, whistles and claps far outsounding the fanfare given Webber. And Pizzonia loved every minute of it. Maybe his pranks represented revenge of a different nature. Immediately seeing his charge outgunned to the second Williams race seat by Nick Heidfeld, Pizzonia's manager Jaime Brito was caught heading Stateside in a quest to gain a CART drive. He was successful in lining up a test with championship-winning Newman Haas team, but Sir Frank is said to have insisted that Pizzonia see out his contract, regardless of whether a (CART) race seat was in the offing or not. Wonder what went through Antonio's mind as he whipped that FW26 about between the barriers?